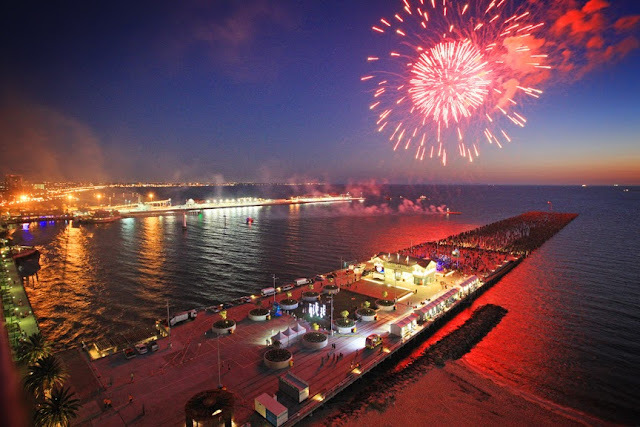 On Saturday 25 January 2014, The Piers Festivalwill bring the Port Melbourne piers precinct to life with a spectacular display of music, dance, markets, exhibitions, forums and more. This colourful celebration of Melbourne’s diversity will link in with Victoria’s Australia Day activities and highlight the state’s rich history of migration. The Piers Festival will run on Princes Pier from 12 to 9:30pm. The event is free, family friendly and will culminate with fireworks. The Piers Festival 2014 will host a wonderful spread of musical artists, including jazz and salsa legend Jimmy Bosch (USA/Puerto Rico) and the Salsa Kingz, Russian thieve music by VulgarGrad, classical Indian vocals and a Greek music spectacular. Audiences can also take part in an equally diverse array of dance including Albanian, Sri Lankan, Welsh and world-renowned African drumming and dance performers Asanti Dance Theatre. There will also be diverse food, arts & crafts, photo & historical exhibitions, storytelling, choirs and kid’s activities. There will be something for everyone with even more artists to be announced! A special feature of the Festival is the Migration Forumswhere the audience will hear some incredible stories that draw out the universal experience of the migrant. Guest speakers from some of Melbourne's key migrant communities – both established and emerging – will share poignant memories about their experiences of leaving their homelands, their journey by land, sea or sky and how they built their new lives in Australia. Established in 2012, The Piers Festival celebrates Victoria’s incredible cultural diversity by reflecting on the rich histories of both Station Pier and Princes Pier. From the gold rush to wartime, from post-war migration to cruise shipping, these piers have played a pivotal role in Victoria’s growth and offered a gateway to the diversity of cultures that enrich our community. The Piers Festival is proudly produced by Multicultural Arts Victoria and supported by the Office of Multicultural Affairs and Citizenship, Arts Victoria, the Australia Day Committee (Vic), Major Projects Victoria, Yarra Trams and Commonwealth Bank. Transport: Tram 109 lightrail to Waterfront Place, Port Melbourne. Click here to see the BCNA's submission to Planning Panels Victoria on design guidelines for 1-7 Waterfront Place and PSA C104. the 7th which some of us are going to help kick off. So our 3207BP clean will be on 14 December at 9 am, meeting at Lagoon Pier. This is happening over the next couple of weekends. There are lots of activities at the Gasworks Arts Park....check out more on the website link! You have no doubt seen the recent building work going on to form the new Mr Hobson Restaurant. We have heard good reports and decided to make this the venue for our next social event. Please come along and bring your neighbours for an evening of fellowship. You are cordially invited to the 2013 BCNA Annual General Meeting at the Trugo Club in Garden City Reserve on Thursday 17 October at 6:30 for 7:00 pm. At this time there will be the normal election of Office Bearers and Committee Members. A nomination form is included in the attached Notice of Meeting for your consideration. Click here for a copy of the marked up proposed Rules of BCNA. The Committee looks forward to seeing you then.